If your laptop feels like it's on fire, blame Slots of Vegas. Vulcan, our smoking hot online slots game, is erupting with big opportunities to win and everyone is invited to play. Designed for players with low bankrolls and high rollers, too, this is one amazing online slots game that will make you sweat—no matter what your bankroll looks like. The 5-reel, 25-payline slot machine surrounds you with erupting volcanoes. But instead of molten lava, you can look forward to hot rewards like big money flowing in your direction. 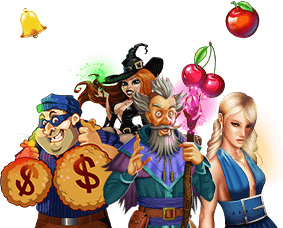 You'll also look forward to two big jackpots, a top payout of 100,000x your bet per line, and explosions of cash when you least expect it. The Volcano is the scatter symbol in Vulcan. Landing on three of them sends you into free game mode where you'll get to play 15 free games without spending any credits. You need to bet the max number of lines to trigger the 15 free games. If you bet fewer than all 25 lines and you land on three Volcano symbols, you'll play 12 free games. You'll also want to keep your eyes open for the Vulcan symbol. It's the substitute symbol, and that means it can help you finish any winning combination. So if you need three symbols to line up and you've got two matching ones plus a Vulcan symbol, you'll get paid out. And best of all, the prize will be multiplied by three. The rest of the game is self-explanatory. Make your bet and line selections, and then hit Spin to lock in your bet. If your symbols line up, you get paid out. However, you should keep your eye on the Feature Guarantee Meter. Vulcan guarantees that you'll play the bonus round within a maximum of 250 spins, and it counts down the number of spins left for you before the guarantee is automatically triggered. You can attempt to trigger the bonus games randomly, but you'll risk resetting the meter back to the max. If you want to see rewards erupt more often, we recommend turning Autoplay on. Instead of having to manually press Spin each time bets are paid out, the software will do everything for you. Keep in mind that your last locked in bet and line selections will be used on Autoplay. When the reels come to a full stop, bets will be paid out and the software will spin again for you. Plus, if you've managed to score free bonus games, the software will do it all for you, too. Autoplay is worth a try, but if you don't like it, feel free to turn it off. Jackpots: Vulcan has two of them—a major jackpot and a minor jackpot. The major has a $1,000 reset amount and the minor one resets at $250. Both jackpots can pop randomly at the end of the game. Substitute Symbol: In Vulcan, the substitute symbol is the Vulcan symbol. It can substitute for any other symbol in the game to help you make winning combinations. Scatter Symbol: In Vulcan, the scatter symbol is the Volcano. By hitting three of them in a row, you'll get to play a fiery bonus round where 15 games are on the house.